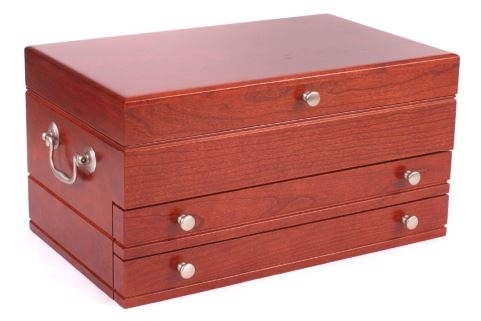 Smell the cherry hardwood in the "First Lady" Large Jewelry Chest Made of solid American cherry hardwood and finished in rich cherry. 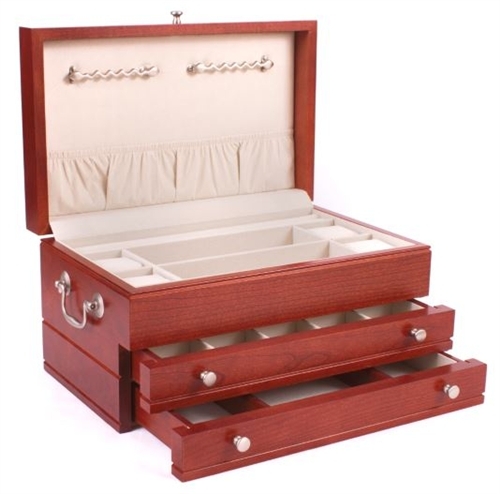 Two multi-compartment pull out drawers, top area contains ring rolls, and swing-out necklace or bracelet hangers. Traditional side handles, all hardware is brushed nickel. A beautiful heirloom piece, made of solid wood here in the USA. The box was beautiful. But getting it was frustrating...I received an email with the wrong tracking number and wrong address...very worried...spent time sorting it out. Your office kept replying "very interesting that you have this tracking number...." It could only have come from your office. An apology would have been more meaningful.